Mrinal Sen (also spelled Mrinal Shen) is a Bengali Indian filmmaker. He was born on 14 May 1923, in the town of Faridpur, now in Bangladesh in a Hindu family. After finishing his high school there, he left home to come to Calcutta as a student and studied physics at the well-known Scottish Church College and at the University of Calcutta. As a student, he got involved with the cultural wing of the Communist Party. Although he never became a member of the party, his association with the socialist Indian People's Theatre Association (IPTA) brought him close to a number of like-minded culturally associated people. His interest in films started after he stumbled upon a book on film aesthetics. However his interest remained mostly intellectual, and he was forced to take up the job of a medical representative, which took him away from Calcutta. This did not last very long, and he came back to the city and eventually took a job of an audio technician in a Calcutta film studio, which eventually launched his film career. Mrinal Sen made his first feature film, Raat Bhore, in 1955. It had the iconic Uttam Kumar who was not a star then. The movie was a let-down. His next film, Neel Akasher Neechey (Under the Blue Sky), earned him local recognition, while his third film, Baishey Shravan (the day when Rabindranath Tagore died) was his first film that gave him international exposure. After making five more films, he made a film with a shoe-string budget provided by the Government of India. This film, Bhuvan Shome (Mr. Shome), finally launched him as a major filmmaker, both nationally and internationally. Bhuvan Shome also initiated the "New Cinema" film movement in India. The films that he made next were overtly political, and earned him the reputation as a Marxist artist. This was also the time of large-scale political unrest throughout India. Particularly in and around Calcutta, this period underwent what is now known as the Naxalite movement. This phase was immediately followed by a series of films where he shifted his focus, and instead of looking for enemies outside, he looked for the enemy within his own middle class society. This was arguably his most creative phase. Depiction of KolkataIn many Mrinal Sen movies from Punascha to Mahaprithivi, Kolkata features prominently. He has shown Kolkata as a character, and as an inspiration. He has beautifully woven the people, value system, class difference and the roads of the city into his movies and coming of age for Kolkata, his El-Dorado. Experimentation, recognition and acclaimDuring this period, he won a large number of international awards. It could be argued that although his films show the development of ideas from existentialism, surrealism, Marxism, German expressionism, French Nouvelle Vague and Italian neorealism, in their stylistic nuances, these films often parallel the cinema of Woody Allen. Like Allen's cinema, Sen's cinema for the most part does not provide a happy ending or a definitive conclusion (unlike many of the films of Sen's better known contemporary Satyajit Ray). In many of Sen's later films, the audience becomes a participant in the process of the development of the plot. The director invites and provokes the audience into a shared process of forming multiple conclusions, that are at the same time unique and different. The director does not play the role of god, his audience does. It is not really surprising that unlike Allen who has a steady niche audience in the Western literati and aficionados, Sen's experimentation with parallel cinema had significantly cost him much of a devoted audience composing of largely the Calcutta based westernized intelligentsia. In 1982 he was a member of the jury at the 32nd Berlin International Film Festival. In 1983 he was a member of the jury at the 13th Moscow International Film Festival. Mrinal Sen never stopped experimenting with his medium. In his later films he tried to move away from the narrative structure and worked with very thin story lines. After a long gap of eight years, at the age of eighty, he made his latest film, Aamaar Bhuvan, in 2002. 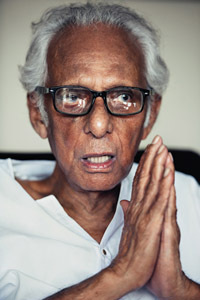 During his career, Mrinal Sen's films have received awards from almost all major film festivals, including Cannes, Berlin, Venice, Moscow, Karlovy Vary, Montreal, Chicago, and Cairo. Retrospectives of his films have been shown in almost all major cities of the world. He has also received a number of honorary doctorate degrees (D.Litt Honoris Causa) from various universities. Mrinal Sen was also elected as the president of the International Federation of the Film Societies. He received the Taj Enlighten Tareef Award which is given for a lifetime contribution to the world of cinema in 2008. He also received the Lifetime Achievement Award at the 10th edition of the Osian's Cinefest Film Festival 2008. On July 24, 2012, [Mrinal Sen was not invited to the function organised by West Bengal government to felicitate film personalities from the State. As per reports, his political views are believed to be the reason for his omission from the function. He is also the recipient of many state-awarded honors. In 1981, the Government of India awarded him with the Padma Bhushan. In 1985, President François Mitterrand, the President of France awarded him the Commandeur de Ordre des Arts et des Lettres (Commander of the Order of Arts and Letters), the highest civilian honour conferred by that country, in recognition of significant contributions to the arts, literature, or the propagation of these fields. He was made an Honorary Member of the Indian Parliament from 1998 to 2003. In 2005, the Dadasaheb Phalke Award, the highest honor given to an Indian filmmaker was awarded to him by the Government of India. He is a friend of Gabriel García Márquez and had often been invited as a judge in international film festivals. In 2004, Mrinal Sen completed his autobiographical book, Always Being Born. Life Time Achievement Award at 5th Global Film Festival Noida 2012.